Larry Bauer is adept at documenting his children's early discoveries, and in so doing creates snapshots of moments that resonate with anyone who has ever parented a child. The discoveries are not always pleasant, as in "sacred ground" in which a daughter learns about death through the loss of a pet fish, made all the more poignant by its deliberate juxtaposition against others that grapple with the death of a family member. Larry Bauer's first full-length collection, family and other seasons of change, is a joy-filled, heartfelt celebration that begs us to "recognize the isful moment of now and the life that pulsates beneath the frozen something waiting to erupt ..."
Larry Bauer's poems celebrate the “little things” in a big enthusiastic way. These are poems of praise-for love, family, the natural world, and the mystery of it all. Here's a poet who wants to sing joyfully, and his words almost seem to dance down on the page. I think family roots us in so many ways we can't possibly name them all. Being aware and open to the magical moments of family, both happy and sad, is a fundamental part of who I am, it feeds my soul. I believe poetry exist around us, every day in every way-its simply up to us to recognize its presence and perhaps, occasionally try to capture it on paper. It's these poetic moments that stop us, give us pause in our busy, hectic lifestyles. I believe that's why so many poems and photographs and paintings are created about sunsets, rainbows, death, because they force us to pause. I also believe that our children's first steps or a blade of grass is equally important-that's why I write about it. larry bauer makes his home in Helena, MT with an incredible fiction writer and two beautiful children. Sandra Alcosser, Montana's first Poet Laureate, invited him to read at the opening of Montana's 2007 legislative session. 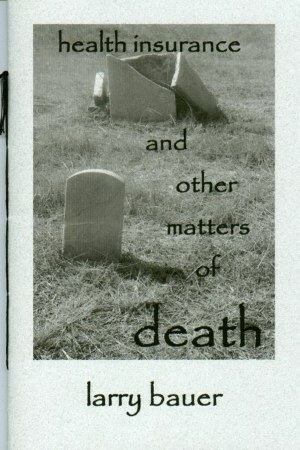 As well, FootHills Publishing has released his first volume of poems, health insurance and other matters of death. His poetry and short stories have also appeared in Literary Mama, Poemeleon, Colors, Wild Roses in Spring, and many others. You may reach him at lbauer@mt.net. The gift of marriage and fatherhood is almost beyond poetic, but occasionally he tries to capture it on paper. is an 80 page hand-stitched paper book w/spine. Whether death welcomes your loved one gently into its other kingdom or if it rips you and your family in half, you will be forever changed. My life has been forever changed, sometimes gently, sometimes by being ripped in half. These poems are an attempt to recognize that there is poetry in pain. Hopefully, you will find yourself within these pages and know that poetry can arise out of your pain as well. That is my wish for all who read this book-enjoy. 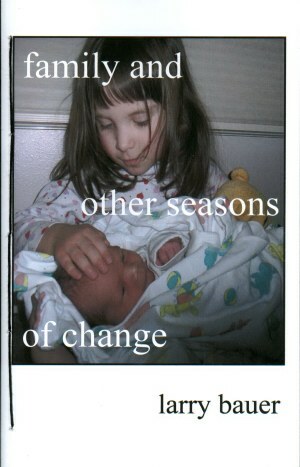 In his debut collection, health insurance and other matters of death, larry bauer grieves. He grieves for a favorite car beyond repair. He grieves for childhood lost. He grieves for lives lost, souls lost. At the heart of it is the grief of having witnessed the startlingly sudden death of a loved one, and what it means to be the survivor. These poems are carefully constructed, but because bauer's distinctive style is not complicated or fussy, they are approachable, with language that is familiar but fresh. He is at his best in this collection when he lets his grief speak through him, as in his poem "pure class," an address to the late Stevie Ray Vaughan. These are poems that dare you to look at them without flinching, written in earnest with an honesty and forth-rightness characteristic of bauer's work. In reading health insurance I am reminded of the many ways death - and life - can take you by surprise. In his new collection, titled health insurance and other matters of death, larry's poems take a darker turn. Each poem is an evocative mini-story. In one of my favorites, “kelsie,” larry uses the voice of a child and creative punctuation in a brilliant illustration that draws the reader to the center of this heartbreaking poem. His poem, “golgotha,” about the death of his brother, combines the lyrical with the realistic, for a stunning result, beginning with a surprising, dramatic opening stanza “i will always remember our last supper at taco johns”. I have finished reading your booklet of poetry - will I ever finish reading this? In fragmented sentences you have brought chilling visions and feelings. The terror children feel torn from all they know: the numbness from the violence that racks our everyday lives and the sadness of losing a beloved one. Yet there is an amusing poignance in letting go of the first car that we share. Thank you for this insight to a hallowed ground. was so loud, it was painful. blind without a contact lens.